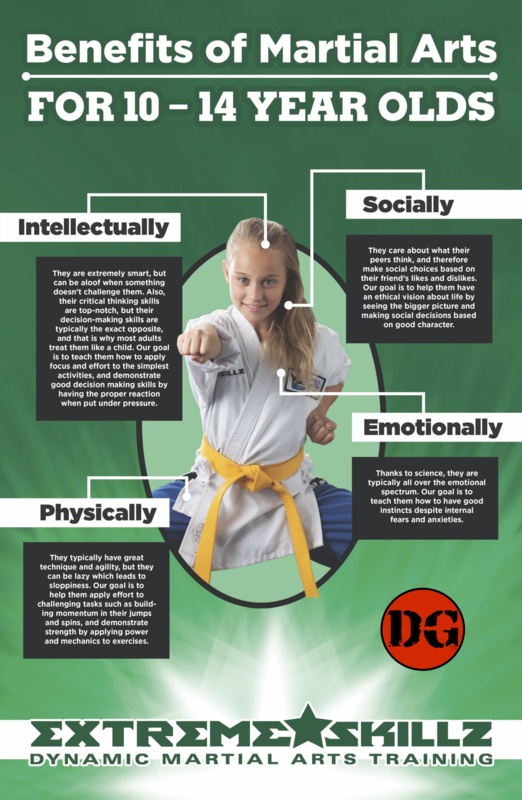 Today I want to share with you the Extreme SKILLZ (10 to 14-year olds) martial arts curriculum breakdown. Ten to fourteen-year-olds are the smartest students in the school. Yes, they are smarter than most adults! The solution we found is to provide them with their own program that targets their stage of development in a manner which nurtures their social and emotional instability while at the same time building skills that set them up for success. With that said a structured program introducing extreme skill-based training in Martial Arts has proven to be very successful. Read on, to see a quick summary of the 8 skills or qualities that we help develop in our Extreme SKILLZ program. DEXTERITY - this skill helps students develop sharpness in their technical and mental capabilities. REACTION - this skill helps students respond quickly and make good decisions under pressure. VERSATILITY - this skill helps students improve their capabilities to carry out a variety of tasks simultaneously. MOMENTUM - this skill helps students improve force and speed in their movements. PRECISION - this skill helps students improve their focus and accuracy. INSTINCT - this skill helps students develop the ability to know what to expect and how to respond to challenges. STRENGTH - this skill helps students develop more power in their arm, leg, core, and cardio muscles. VISION - this sill helps students see the bigger picture of the importance of social integrity. P.S. *Please note: This is copyrighted content including the 'skills' for each program. I am sharing this as an example to help you understand the concept of how we teach martial arts to Children. It can only be found at licensed SKILLZ schools.